THE 2012 Optus Gympie Music Muster is already gearing up for a massive delivery with Early Bird Ticket Sales now on offer. After celebrating its massive 30th birthday in 2011, the Gympie Music Muster is preparing to follow-up it's milestone delivery. For those keen to grab a bargain and secure their place at the iconic event this August, early bird tickets are a welcome return and are on sale. The Optus Gympie Music Muster is a nationally recognised event attracting over 60,000 to the picturesque Amamoor Creek State Forest. Its 2012 delivery is expected to attract even more with a wide array of entertainment currently being confirmed and experiences for the young, young at heart and die-hard fans being secured. The Early Bird ticket sale allows Muster goers to purchase and secure their place without queuing but also provides them with a discounted ticket price that is only on offer for a short time. With the confirmed artist line-up set to be announced mid-2012, organisers are already confident with the entertainment schedule on offer and believe that it will surpass all expectations as a follow-up for such a milestone event in 2011. "The 2011 Muster was the opportunity to recognize the significant history of the events three decade milestone while showcasing the future for the event. "In 2012, we plan on delivering on our commitment of fostering our artists and showcasing new stars. We are working hard towards presenting an unforgettable four day experience", said Ms Vickii Cotter, CEO Gympie Music Muster Ltd. While big name stars will be sure to take to the stage at the 2012 Optus Gympie Music Muster, event organisers are also working on developing the stars of tomorrow with the Maton Talent Search competition aspect of the event set to receive a re-engerised focus. Organisers are looking forward to working alongside industry professionals to provide future winners with guidance and support in developing their professional careers. There's no denying that the rain and mud took prominent place at the 2011 event, but the August 2012 Muster is hoping to deliver clear skies and warm weather based on the event's history of year on, year off. While weather conditions are not yet forecast, its 31year history suggests (and organisers' fingers are crossed) that the 2012 Optus Gympie Music Muster will be the 'year off' with sunshine and festivities in order. 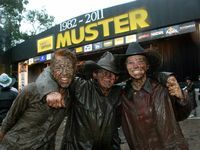 Organisers recommend 2012 Muster goers take the opportunity to secure their place at the discounted early bird ticket price now prior to the event going on general sale through a number of avenues. Tickets can be purchased online at www.muster.com.au. Optus is proud to return to the Gympie Music Muster for the third year as naming rights sponsor and is ensuring festival-goers are kept connected right the way through the event. The 2012 Optus Gympie Music Muster will take place at the Amamoor Creek State Forest Thursday August 23- Sunday August 26. Get tickets at www.muster.com.au or by phone 5482 2099.